It’s hard to believe 2017 is basically over. Whether you had a “ehhh” year or an amazing one, it’s time to let it all behind and celebrate BIG. Here are several options from free events to pricey extravaganzas to ring in 2018! HARBOURSIDE PLACE COUNTDOWN TO 2018: Head to North Palm Beach County at 9 p.m. and experience this free New Year’s Eve event. The “Times Square” ball drop on the waterfront amphitheater — streaming live on a 16-foot screen — will have a live musical performance by Wildfire. For info: Harbourside Place. NEW YEAR’S EVE BASH 2018: Celebrate the 8th annual New Year’s Bash at Guanabanas Island Restaurant and Bar in Jupiter. You know what’s good? No reservation and no cover all night. Listen to live music by Spred The Dub and Savi Fernandez Band. The party starts at 9 p.m. Dec. 31, and you must be 21 or over. Information: 561-747-8878. DOWNTOWN’S NOON YEAR’S EVE: Nothing says Happy New Year like a free event. Get your kids ready and head over to Downtown at The Gardens for an afternoon full of activities: carousels, face painting, games and more. The party is 11 a.m. to 1 p.m. on December 31, 2017 at the Carousel Courtyard. Information: 561-799-4100. MASQUERADE BALL ON THE WATERFRONT: This Black & White Affair promises to be an enchanting evening of music, food and merriment. The $150 per person price tag will get you a live dj, an open bar, an horderves buffet, a dinner buffet, a dessert buffet and a champagne toast. Don’t have a party mask? Visit Uptown Art to make one. SUBCULTURE GROUP’S 5 VENUES, 1 PRICE PARTY: The 500 Block of Clematis in West Palm Beach aims to please: no velvet ropes, no hassels, no fancy pants. Just you, the rest of the city and ringing in the new year together. There are options for everyone, from $45 to $80 and access to Subculture’s hottest block, which includes Hullabaloo, Kapow, Respectable Street, Lost Weekend and Voltaire. IL BELLAGIO’S NEW YEAR’S EVE: Start the new year with an Italian Feast at 5 p.m. or 9 p.m. on December 31, 2017. According to their Facebook page, “The first seating will be $65 and include a 3-course meal. The second seating will include the 3-course meal and NYE party favors for a cheerful celebration.” Buy tickets here or fill out the reservation form and either drop it off at the restaurant or email back to: manager@ilbellagio.com to confirm your evening. NEW YEAR’S CELEBRATION AT BANKO CANTINA: The celebration at Banko Cantina has the charm of a Mexican cantina with an American twist. It features open bars, entertainment, dancing, dining and bottle packages. This year’s theme is “Blue & Gold.” Countdown on large screens, complimentary champagne toast and New Year’s balloon drop. For information, call 561-355-1399 or email: info@bankocantina.com. CHEERS TO YOUR HEATH WITH A VEGAN BUFFET: No better time to start eating right than on the first night of a new year. So grab the fam and your appetite and head over to Hippocrates Health Institute for a tasty, raw living foods buffet, starting at 6 p.m. It’s $45/person and $22.50 for kids 12 and under. Enjoy the raw snacks and toast to the new year with sparkling apple cider on December 31, 2017. Oh, there will be live music and dancing, and of course fireworks at midnight. RSVP is required: Call 561-471-8876. NOON YEAR’S EVE AT SCIENCE CENTER: Celebrate the new year with family activities at the South Florida Science Center & Aquarium in West Palm Beach. The party kicks off at 11 a.m. on December 31, 2017 with face painting, crafts, DIY confetti launchers and more. Activities included with General Admission. PARTY LIKE A PALM BEACHER: OK, you’re not likely to get into the exclusive Cocoanuts Ball at the Flagler Museum on New Year’s Eve. But you can check out the fireworks display for free on either side of the Intracoastal December 31, 2017. TIDELINE OCEAN RESORT & SPA’S TRIBUTE TO BEATLEMANIA: Enjoy the original cast of Beatlemania singing and performing as you indulge in dinner at Tideline Ocean Resort & Spa in Palm Beach. There are two dinners: at 6 p.m. for $125 in advance or $150 at the door featuring a 3-course dinner and wine pairing, and at 9 p.m. $150 in advance or $200 at the door with a 3-course dinner, wine pairing, Mizu sushi and champagne toast. $45 for children 11 and under. A NIGHT AT MOULIN ROUGE: Watch the ball drop on a big projector and party all night with DJ Gabriel on December 31, 2017. There’s a 4-course fixe menu, $50 for 6 p.m. seating and $80 for 8:30 p.m. Reservations required: 561-793-2110. NEW YEAR’S EVE 2018: Celebrate the new year with “It Was All A Dream,” a party at SALT7 on December 31, 2017. The celebration goes from 9 p.m. to 4 a.m. For dinner and bottle service reservations, email Kembrell@SALT7.com. There is no cover charge. 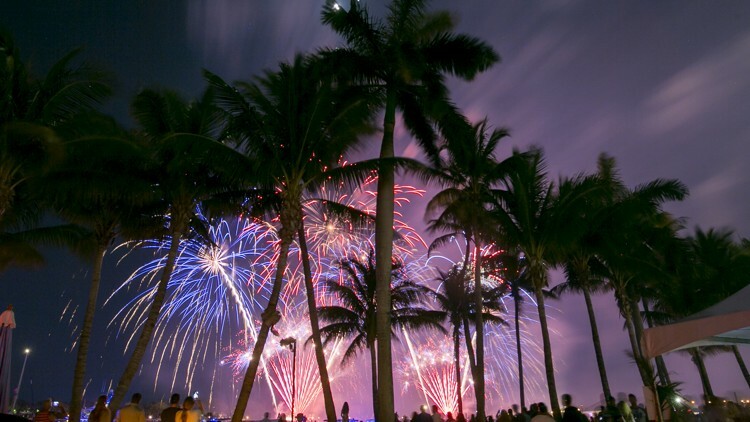 NEW YEAR’S EVE DOWNTOWN: Visit Delray’s Old School Square Park and enjoy a free New Year’s Eve event starting at 5 p.m and ending with fireworks at 9 p.m. The carousel, mini-golf and ice skating has a cover of $3. There will be food trucks on site and live music starting at 5 p.m. with a surprise band and DJ from 7 p.m. to 9 p.m. on December 31, 2017. Information: Visit Delray Beach website. BOSTON’S ON THE BEACH NYE: Enticing edibles and live entertainmnet by Victor Wainwright and The Train welcome you to this party by the beach. The celebration is from 9 p.m. to 1:30 a.m. featuring two buffets, champagne at midnight and a breakfast buffet. Tickets are $80. Buy tickets here. NEW YEAR’S EVE 2018: Head over to Blue Martini Boca Raton starting at 8 p.m. and party with live music all night long. It’s an elegant, attire-required kind of night. You get live entertainment, open premium bar and hors d’oeuvres until 10 p.m. on December 31, 2017. Countdown and champagne toast at midnight. Information: 561-350-9643 or email Trishap@bluemartinilounge.com. Reservations requiered. ROCK THE BLOCK 2018 : Ring in the New Year with the hottest party in Boca featuring Salt N’ Pepa & DJ Spinderella, Wang Chung and A Flock of Seagulls. Event starts at 8 p.m. on December 31, 2017 at the Boca Raton Resort & Club. And there’s even more depending on what ticket you purchase — an event for everyone’s taste. The New Year’s countdown is followed by a midnight fireworks show on the 18th fairway. Prices range from $75 to $150. To find out the details, contact 561-447-3000 or click here for reservations. CIRQUE DREAMS 2018 SHOW: Head to the Cathedral Room at the Boca Raton Resort & Club at 5:30 p.m. on December 31, 2017. for a special Cirque Show for all ages. It’s a blend of world-renowned imagination and theatrical innovation. Tickets start at $150 per person at bocaresort.com/events. FUNKY NEW YEAR’S EVE PARTY! : Ring the new year in a funky way at Funky Buddha Lounge and Brewery. You’ll get five bands, craft beer, music, a beer toast at midnight and a complimentary, late-night breakfast before closing. Doors open at 7:00 p.m. on December 31, 2017, and show starts at 8:00 p.m. Tickets available here.